Ingerval is the Country of the Dead.Despised by the wider world, blighted by history, since the beginning of time it has honoured one law: the Dead rule, and the Living submit.</b> No one remembers why Ingerval nobles return as ghosts after their deaths. To enjoy a brief life of pleasure and plenty, followed by an eternity of reigning from beyond the grave, is the fate of all Ingerval lords. All but one.As the youngest son of the King's third wife, Syphax never thought he would amount to anything. He is content to live out a contemplative life free from the scourges of power and politics that infatuate his peers. But, after answering a summons to the Palace - a sprawling, ever-expanding repository for Ingerval's ghosts - he finds himself at the heart of a dynastic struggle centuries in the making.Funerals are happy occasions in Ingerval, and the King is planning for his to be the most decadent in the country's long memory. He does not know that, unlike every lord before him, he will not return to rule alongside his ancestors. He will die the true death, sparking a succession crisis that throws the noble families into chaos. Amidst the violence and intrigue, Syphax alone asks, "What really happened to the King?" The deeper Syphax digs, the more he realizes these events are connected to others dating back to the founding of his father's dynasty.Let the games begin. Admiral Horatio Hornblower has given Commander William Brewer captaincy of the captured pirate sloop El Dorado. Now under sail as the HMS Revenge, its new name suits Brewer's frame of mind perfectly. He lost many of his best men in the engagement that seized the ship, and his new orders are to hunt down the pirates who have been ravaging the trade routes of the Caribbean sea. But Brewer will face more than one challenge before he can confront the pirate known as El Diabolito. His best friend and ship's surgeon, Dr. Spinelli, is taking dangerous solace in alcohol as he wrestles with demons of his own. The new purser, Mr. Allen, may need a lesson in honest accounting. Worst of all, Hornblower has requested that Brewer take on a young ne'er-do-well, Noah Simmons, to remove him from a recent scandal at home. At 23, Simmons is old to be a junior midshipman, and as a wealthy man's son he is unaccustomed to working, taking orders, or suffering privations. William Brewer will need to muster all his resources to ready his crew for their confrontation with the Caribbean's most notorious pirate. In the process, he'll discover the true price of command. In the summer of 1985, fifteen-year-old Sam Crowhurst discovers an old abandoned cinema that screens movies made by ghosts, for ghosts. Sam, along with his friends, Emma and David, find themselves drawn into a world where the likes of Humphrey Bogart, Lon Chaney and Theda Bara are still making pictures; where Harold Lloyd and John Belushi team up for roustabout comedies, and Karloff and Lugosi appear in films scripted by Edgar Allan Poe. Sam comes to learn the mysteries of the Electric cinema and his part to play in its long and strange history. THE ELECTRIC is about movies, ghosts, and that ephemeral moment in all of our lives, childhood. An epic fantasy production enhanced by special effects. With music by Orchestralis, available at Orchestralis.net. Turn the phone off, lock yourself away, and give your mind the holiday it deserves from the cares and stresses of this world when you read the latest volume of cult author Tom Slemen’s Haunted Liverpool. It is always an event when Tom publishes a new book and this one is definitely no exception. In this chilling volume of more than 30 chapters - with many chapters containing more than one story - you will meet the Faceless Bride of Lime Street and you will also be introduced to Anfield’s unknown ghostly woman before visiting the creepy establishment known as The Devil’s Arms, where everything is just too good to be true. You will not find the usual hackneyed stories of supernatural cliché in this volume; you will find extraordinary and sometimes surreal terror lurking that will play on your mind and possibly inspire a nightmare or two. Celebrating the 100th birthday of the world's favorite amateur sleuth, Father Brown! This is a new edition of the first collection of G. K. Chesterton's masterful mysteries, The Innocence of Father Brown. Contains 12 thrilling tales, including "The Blue Cross", "The Invisible Man", and "The Sins of Prince Saradine". 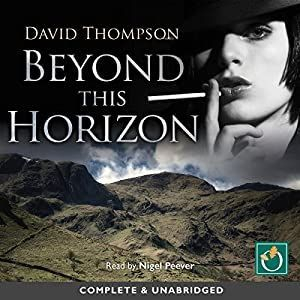 The audiobook is expertly narrated by British actor Nigel Peever, who brings to life Father Brown and all of Chesterton's marvelous characters. Demon’s Deep mine is out of action. The miners are missing, and psychotic savages - The Unbound - have taken it over. Unfortunately, where the Unbound go, bad magic follows. Magic which mutates living things, and liquefies rock. Will honor and camaraderie be enough? Join Kiprik and the boys on this heart wrenching, epic fantasy adventure. If you enjoy complex characters, gorgeous settings and a big, big world, you’ll love this. 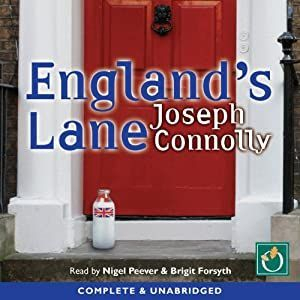 The Great Detective's worst fears are realized when on the morning of the summer solstice, he learns that the body of a young man has been discovered in the eye of the White Horse of Uffington. Like the first victim, he too has been marked with a druidic symbol and his body bears a message. Aside from the symbol and the message, the only other difference appears to be that his body and organs have been surrounded by willow branches. Welcome to Haunted Liverpool 29, another spine-chilling collection of stories by Tom Slemen, a writer who has gained a cult following across the world. In this collection of over 40 sinister yet fascinating tales, Tom Slemen will tell you about the strange Vampire Cult which promised Eternal Life - in exchange for your blood - and soul and of the two mysterious self-styled vampire hunters that took on the cult. You will also be chilled by the accounts of a creepy parasite known as the Grave Worm, which has left cemeteries to seek living flesh because of the rise in cremation. In this incredible book, you will also hear about the pregnant New Age traveller who turned into a werewolf before the eyes of the shocked and terrified midwives and nurses of a maternity ward. You will be fascinated by the case of two lovers who had known each other over many lifetimes stretching back to the Dark Ages, and you will also be intrigued by the witch who was hounded by doctors because she kept on curing their patients with her white magic. In Haunted Liverpool 29, there are stories about time-slips, bizarre bogeymen, ghosts, vampires, werewolves, witches, doppelgangers, occultists, time travellers, shape-shifters, weird killers, creepy dolls, parallel worlds, and there is even an appearance by Jack the Ripper! The Killer is the first in a series of three fast-paced fiction thrillers. A story of espionage, suspense, and terrorism, following Darren/Butch McCann, whose adventures begin amid the bombings and violence on the war-torn streets of 1970s Belfast. His survival depends on his ability to fight, he learns quickly and fights well. The Provisional Irish Republican Army attempt to recruit him, but he refuses to take sides - until a family tragedy draw him into the ranks of IRA and their cause. Military training follows and he's found to be an excellent sniper and freedom fighter, but it is one night, and one brutal interrogation, which earn him a reputation as "The Butcher of Belfast", pairing him with his infamous knife, The Killer. Following a high-profile kill he's forced to flee Ireland and take refuge in Spain, where he becomes involved with an ETA paramilitary unit at their training camp deep in the Basque country. There, a thrilling and daring raid ensues, and strong alliances are formed with his new brethren. The Provos, and an old friend, call him back to service. He performs his duty but, a moment of doubt convinces him that his home is now in the hills of Spain. McCann knows he will always fight against the establishment. But, one British military intelligence agent has other ideas. For as long as Lottie Fiske can remember, the only people who seem to care about her have been her best friend, Eliot, and the mysterious letter-writer who sends her birthday gifts. But now strange things and people are arriving on the island Lottie calls home, and Eliot's getting sicker, with a disease the doctors have given up trying to cure. Lottie is helpless, useless, powerless. Follow Lottie down through the apple roots to another world - a world of magic both treacherous and beautiful - in pursuit of the impossible: a cure for the incurable, a use for the useless, and protection against the pain of loss. Book 1 in the spellbinding Water and the Wild fantasy trilogy. Welcome to the Mirror Empires, where reality is distorted, and war threatens to engulf the world. It is 1898, and soldiers armed with the latest weapons clash with the unstoppable power of the Sky Lords and their aerial armadas in new and uncharted realms. Jack never expected to spend his 19th birthday crashing a stolen flying machine into the middle of a war. But when he saw soldiers with bolt-action rifles up against an advanced species, he knew he’d found something incredible. As they storm Khartoum’s fortified city walls, Jack and the soldiers are transported to an impossible version of their own world. One where great cities rise up into the sky and are endlessly circled by flying warships crewed by beings never seen before. As they set out to explore this strange land filled with violent tribes and vicious creatures, they uncover a brutal regime that takes slaves and technology from every mirror world they can find. Known as the Sky Lords, they are protected by legions of warriors who travel the skies in their flying warships, and they will stop at nothing to destroy the newcomers and retake the city that links the Mirror Empires together. It is a world where the rules of science and technology have been smashed to their very core. Once again, legendary researcher and investigator of the supernatural Tom Slemen brings you a chilling yet thought-provoking collection of 50 tales of the paranormal in Haunted Liverpool 23, and in this eagerly awaited audiobook you will be introduced to the sinister “Cosmic Joker,” who has a cruel and deadly sense of humour, and the joke is always on you as he flouts the laws of probability and stacks the odds against you in a terrifying way. Unravel the mystery of the top secret military train that arrived in Liverpool’s Central Station – was it carrying a nuclear missile? The bizarre well-documented case of eerie doppelgangers that menaced a Liverpool couple. The terrifying yet inexplicable reports of werewolves at large in Liverpool. The weird story of Renshaw Street’s Faceless ghost – who was he? A sinister case of a real-life Skeleton in the Cupboard in the Anfield district of Liverpool. The unfortunate former solicitor who was trapped in a dimensional hell between this world and limbo - What was his fate? The Liverpool housewife who was accosted by a group of ghosts from different eras as she lay in a hospital bed after an operation - They wanted to take her over to their side. The Crosby man of 1973 who talked to a Texan woman in 1962 via shortwave radio – and warned her of JFK’s assassination. The many chilling reports of the ghosts and apparitions haunting the roads. Welcome to Haunted Liverpool 28, another dazzling collection of supernatural stories by Tom Slemen, arguably England’s greatest writer on the paranormal. 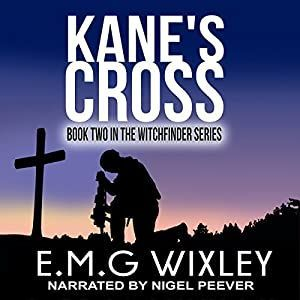 In this exceptional audiobook, you will hear about Liverpool’s mysterious third cathedral - dedicated to Mother Nature - which appears and disappears in the mists of time, and you will also encounter a timid man who was possessed by the spirit of an ancient king via an antique chess set. Hear also about the many intriguing time-slips in the city, including the disturbing case of a modern female club-goer who was abducted by two rapists from the 18th century. You will also find yourself holed up in the dead of night with two Liverpool security guards who find themselves under attack from a giant vampire, and you will hear the weird case of the adulterous businessman who enlisted a real magician to spirit away his wife! The teenage girl who discovered that her doctor was leading a double life - as a werewolf! The Huyton bachelor who found himself living in different eras with three different wives! Liverpool’s cursed families.... Is your family cursed? These are just some of the tales of terror, intrigue, and the unknown which you will find in Haunted Liverpool 28! The dead beckon and the girl obeys. Night after night, she answers the graveyard's call, though she dreads her encounters with the creature that dwells there. But she'll soon come to learn that memories are much more dangerous than monsters. All of this plus many, many more scary stories from the master storyteller Tom Slemen! Still recovering from his previous assignment in Arabia, imperial agent Cassius Corbulo has been spending most of his time and money on women and wine. Unfortunately for him, word of his achievements has reached Emperor Aurelian's deputy, and he is sent north, tasked with smashing a counterfeiting gang. 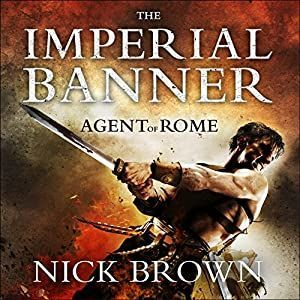 Cassius tracks the criminals to the city of Berytus, where his investigations are hampered by civil unrest and uncooperative officials, not to mention the personal problems of his servant, Simo, and bodyguard, Indavara. Despite this - and intense pressure from his superiors - the young officer eventually closes in on the gang. But his enemies will do anything to protect their profits, and Cassius and Indavara soon find themselves fighting not only for the emperor but for their very survival. Welcome to the long-awaited Haunted Liverpool 27 - which contains over 40 stories of the uncanny and the downright weird; a collection of strange, terrifying, and even romantic tales by Tom Slemen, one of England's premier writers and researchers of all things supernatural. In this astounding volume of weird stories you will hear of Trix, a bizarre paranormal entity who appears as a sinister jester at a certain place on Renshaw Street, the crazy case of two men who swapped their lives, and in this book you will also learn of the Everton Witch, who cursed and even killed people with her spells. There are also unearthly tales of a woman who could gauge the true nature of people - including Reggie Kray - by reading their auras, and there are some very strange accounts of disembodied legs that haunted a Fazakerley house, a cat that somehow became a beautiful teenaged girl, a radio in a Duke Street cafe which gave tomorrow's news, a terrifying phantom nun who stalks Knowsley, and most bizarre and disturbing of all - the "Gloater" - a creepy man who roams Anfield Cemetery, mocking the dead - till a couple of local men decided to teach him a lesson. You will also savour supernatural stories concerning the violent ghosts known as the Scotch Uncles, and a real-life shapeshifter which caused a Liverpool girl to have a nervous breakdown - and he's still out there. You will also find more accounts of local vampires in the amazing book, as well as a number of newly-documented timeslips, and a glimpse of a version of Liverpool where there are no men - and in addition to all this there are stories of some disturbing local cults - including the one that tried to sacrifice a young lady returning from a night out at the Paradox Club. Dexter LeGrasse thought he was lucky to be alive. He was wrong. The only survivor of a plane crash over the Atlantic, he finds himself washed up on an uninhabited island. Dazed, dehydrated and desperate to escape, he will have to use all his wits just to stay alive in a strange and unforgiving environment. But when he discovers an ancient ruin, he unwittingly unleashes an unstoppable evil and his nightmare truly begins. Primal, merciless and fueled by a burning hatred, the creature has a hunger that must be appeased. It hunts Dexter wherever he goes, driving him to the edge of his own sanity, and with time running out and no place left to hide it's escape...or die. A heart-pounding chase across lethal terrain, Maldición splices the rush of a survival thriller with the twisted creations of HP Lovecraft to create a man versus monster tale unlike any other. The book begins with a brief examination of the effect that the stories have had on modern crime literature. It goes on to examine the origins of the character of Holmes himself from his appearance to his drug use and supposed dislike of women. We then move onto a mini-biography of some of the significant characters in the series. 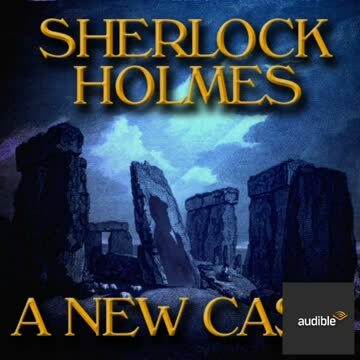 Each of the original stories by Conan Doyle is examined in an effort to explain some of the more esoteric aspects and an examination is made of the attempts to form a proper chronology for the stories - as Doyle did not write the stories in strict chronological order. The second half of the book focuses on Holmes's career on the screen. There is a brief examination of some of the more notable actors to have portrayed Holmes and the films in which they appeared. Finally we look at the possible requirements for a definitive screen portrayal of the canon. * The terrifying power of the Evil Eye, which could be upon YOU at this moment…so how do you deflect its lethal powers? * The many well-documented visits of a Reaper-like being who comes to collect those who have an appointment with death…will he be coming for you soon? * The sinister vampire stalking Hollywood – who is he? Just SOME of the unearthly, horrifying but fascinating stories unearthed by the unrivalled master of the supernatural – Tom Slemen, in Tales of the Weird! From the author of The Cotswolds Werewolf comes a new collection of Sherlock Holmes pastiches in the vein of Conan Doyle, revealing for the first time the secrets behind the theft of the hobnailed boots, the mysterious madness of the Right Honourable Wilfred Crabb, the case of the haunted public house, the curious and seemingly supernatural events surrounding a remote hotel on the east coast, and the truth behind the strange disappearance of Cyrus Thicknesse, the man in the sensible necktie. "I must say, Holmes, I am a bit surprised to see you taking an interest in something based on sympathy." "You do not think me sympathetic?" "Of course I do. But you have said yourself that it is the rational challenge and not the human aspect that draws you to your cases. Humans are mere factors in a problem, I think were your words." "Did I really say that? Hm, well, I am an odd sort, am I not?" Welcome to the 24th volume in the legendary series of the Haunted Liverpool books. In this fascinating and chilling collection of over 40 spine-tingling stories, you will encounter real zombies, terrifying ghosts that physically inflict harm on the living, as well as an abomination known as Long-Legged Alice that is guaranteed to give you many sleepless nights. Cult writer Tom Slemen once again will make you question all concepts of logic and reality, and he will inform and entertain you with his inimitable style of storytelling which has now attracted a massive following of listeners from around the world. This ground-breaking book also documents the bizarre world of Liverpool's many real-life superheroes, the galaxy of famous ghosts haunting Liverpool, from a major Hollywood star to globally famous musicians. Hear also of Black Hood, Wirral's greatest occult secret, and discover the unearthly goings on under the forgotten tunnels of Copperas Hill. Tom also tells us more of the intriguing timeslip occurrences he has investigated in the northwest, and there is an incredible account of a Liverpool drifter who found a long-vanished nature-worshipping people who inhabited Manhattan long before the Native Americans even settled there. Just some of the strange, uncanny and phenomenal stories of Haunted Liverpool 24! Adopted from an early age Angelica is looking for her mother. Regressed by her friend Max, she is plunged into a world of murder and mystery, which belies her ordinary life. Charlie her son is an addict and becomes involved with a religious cult, which forces him to re-examine the life choices he's made. Kane is trying to stay sober and will go to any lengths to protect the ones he loves. Poppy forever at his side is also struggling against demons. With humankind on the brink of annihilation, a bond is created amongst the group as they struggle to survive. The results of their journey into the unknown are completely unexpected and mean their lives will never be the same. 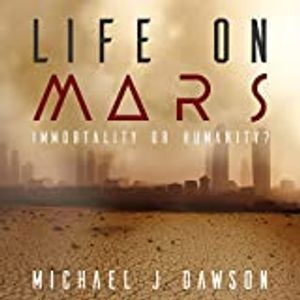 This book may be listened to as a standalone. When the papal apartments are burgled in 1901, Sherlock Holmes is summoned to Rome by Pope Leo XII. 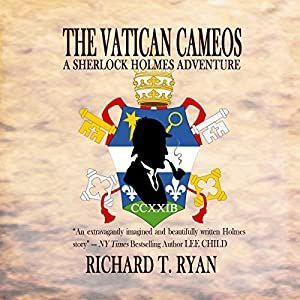 After learning from the pontiff that several priceless cameos that could prove compromising to the church, and perhaps determine the future of the newly unified Italy, have been stolen, Holmes is asked to recover them. In a parallel story, Michelangelo, the toast of Rome in 1501 after the unveiling of his Pieta, is commissioned by Pope Alexander VI, the last of the Borgia pontiffs, with creating the cameos that will bedevil Holmes and the papacy four centuries later. For fans of Conan Doyle's immortal detective, the game is always afoot. However, the great detective has never encountered an adversary quite like the one with whom he crosses swords in The Vatican Cameos. Someone is killing sheep in the Cotswolds. Or something. As Holmes and Watson arrive in the tranquility of a little village of shepherds and farmers to enjoy a few restful days in the idyllic countryside, strange things start to occur. 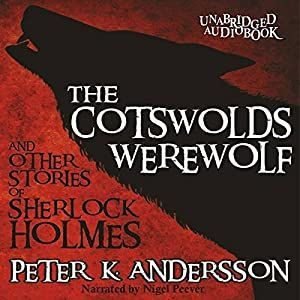 While Holmes locks himself in his hotel room, consumed by depression, Watson is left to explore the surroundings on his own, acquainting himself with both the local shepherding community, the eccentric vicar, and the local folklore concerning a mysterious werewolf. It isn't long before the murderer directs his attention to other prey than sheep, and Holmes is forced out of his ennui into a world of fog-enshrouded moors, wild men, pitchforks, and a big bad wolf. This volume also includes four shorter stories in the vein of Conan Doyle: "The Adventure of the Velvet Lampshade", "The Adventure of the Missing Mudlark", "The Adventure of the Forking Paths", and "The Adventure of the One-Armed Pugilist". The bizarre and unsettling reports of unearthly 'mannequins' - synthetic humans who have been encountered all over the city - who makes them and what are they? The chilling phenomenon reported by nurses, doctors and surgeons known as the "Smell of Death"
Can you unravel the perplexing case of the mass hanging of 20 brides and bridegrooms at a Liverpool hotel? Just some of the tales to be found in this collection. Listen at your own risk! Kane is a burned out soldier suffering from post-traumatic stress. He comes from a dysfunctional family. 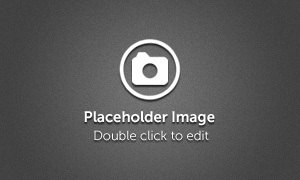 His parents are divorced, his sister is missing under mysterious circumstances, and his mirror twin half-brothers are displaying disturbing behaviors. It's whilst drowning his sorrows that he meets a strange girl who asks him for help. Under her influence, they embark on a transformative journey together. Soon everything about Kane's life is different. Kane knows he will have to kill their adversaries before they are all murdered. This book may be listened to as a standalone. It’s 1981 and seventeen-year-old Christine is about to give birth to her son. 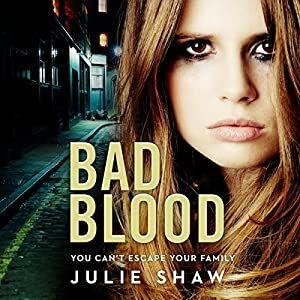 When her family throw her out, Christine has the biggest fight of her life to bring up her son safe on the infamous Canterbury Estate in Bradford, rife with crime, alcohol and drugs, a place where family is everything and nothing. It's Friday evening on the Canterbury Estate in Bradford and Christine, who's been rushed to hospital by her friend, Josie, is on the maternity ward giving birth. She's 17 and terrified. Not just of the pain, which is ripping her in two, but because she knows that once the baby arrives, her family is never going to speak to her again. Her beautiful baby boy is about to start a chain of events that will lead to tragedy - and only her own family can save her. AD 270. Rome has ruled Syria for over three centuries. But now the weakened empire faces a desperate threat: Queen Zenobia of Palmyra has turned her Roman-trained army against her former masters, and the once invincible legions have been crushed. Arabia, Palestine and Egypt have fallen, and now Antioch, Syria's capital, stands exposed. Cassius Corbulo is a young intelligence agent fresh from officer training. He has been assigned the menial task of rounding up wounded legionaries, but then urgent new orders arrive. He is the only ranking Roman officer left in the line of the Palmyran advance. He must take command of the fort of Alauran, the last stronghold still in Roman hands, and hold it against the enemy until reinforcements arrive. What Cassius finds at Alauran would daunt the most seasoned veteran, let alone a 19- year-old with no experience of war. 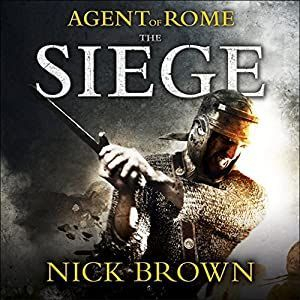 Treason waits at the furthest reaches of Empire...When the deputy commander of Rome's Imperial Security Service is assassinated on the island of Rhodes, Cassius Corbulo swiftly finds himself embroiled in the investigation. Assisted once more by ex-gladiator bodyguard Indavara and servant Simo, his search for the truth is complicated by the involvement of the dead man's headstrong daughter, Annia. 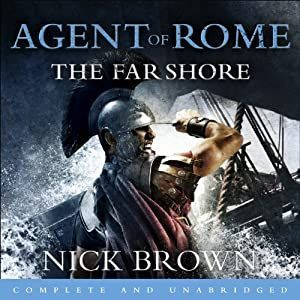 Braving hostile seas, Cassius and his allies follow the assassin's trail south aboard a ship captained by a roguish Carthaginian smuggler and manned by his disparate, dangerous crew. 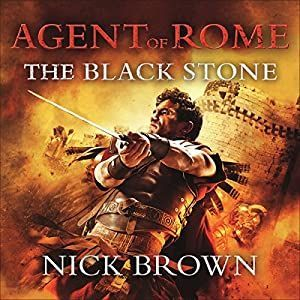 Their journey leads them to the farthest reaches of the empire; to a ruined city where the rules of Roman civilization have long been abandoned, and a deadly battle of wits with a brutal, relentless foe. The concluding volume in an epic and terrifying trilogy for teen readers. Throughout the world, Dancing Jax reigns supreme. 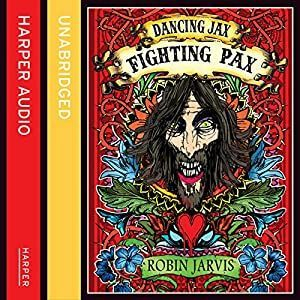 The Ismus and his court are celebrated and adored, and the Ismus is writing the much-awaited sequel to Dancing Jax. But when someone accidentally reads the manuscript, the true, evil purpose of Austerly Fellows is finally revealed. Can the resistance halt the publication of Fighting Pax? Or is humanity doomed and will the Dawn Prince arise at last? Tat, is the first of his family to leave the Upper Eden Valley in Cumbria. He is clever, excels at rugby and has a fine singing voice. From Appleby Grammar School he gains a place at University College London. Tat mixes with art students from The Slade School, and an exciting relationship develops with Jane Cranshaw, a beautiful upper class painting student. They fall in love but he is unaware that Jane conceals a dark secret which fatally flaws their relationship. When their idyll is torn apart by a succession of emotional hammer blows, Tat and his best friend, Olly Sinclair, are engulfed in a whirlwind of turmoil and confusion. Unexpectedly, Tat's magnificent singing voice proves to be his salvation. quiet life of prayer and propriety. No, he loves women: lots of them. Ale: jugs of it. And gambling. But Tom’s principled and proper too, and won’t pull family strings to get himself out of debt. Not even when faced with the very real horrors of London’s notorious debtors’ prison: The Marshalsea Gaol. Offered the opportunity to free himself by solving a murder, Tom finds his principles tested to the limit. The Ballad of Bill McKenzie is the haunting and Gothic first volume introducing us to the universe and characters of the Magic Mattress series of books. Epic tales of high fantasy, ghosts, monsters, adventure, mayhem and mystery... all happening in our familiar world: just out of sight; or there, in the corner of your eye. Herein lies a ghostly little tale of top hats and tall booted fantasy, to stir the unquiet imagination. There is a most infamous ghost in Liverpool. A legendary apparition, to inspire dread and wonder, and his name: Bill McKenzie. He has haunted the city streets in his top hat and tall leather boots for as long as any can now remember. Yet, all anyone truly knows about him is wild speculation and rumour. His is a dark mystery that has remained secreted for a century and more. And there his bones sit on a chair, in a pyramid shaped tomb, in an abandoned church yard, on Rodney Street. Exactly how did McKenzie – in his life, an esteemed engineer and upstanding Victorian - become in death, this ghastly green-eyed spectre that strikes mortal terror into all who should glance upon him? Why does his restless shade sing among the shadows that dark lament of restitution, justice and revenge? This then, is old Bill’s ghostly tale, told exactly as it happened: beware, for it is a macabre affair of the magical and the supernatural. The eternal game of souls: vast fortunes to be won, and enormous stakes to be lost. McKenzie’s fate, however, is not the end of the story – no, not by any means. It is merely the beginning of the undertaking. The opening moves in a far grander game: a fantastic adventure spanning all of time and creation. Jim and Milly. Stan and Jane. Jonathan and Fiona. Winter, 1959: Three married couples: each living in England's Lane, each with an only child, and each attending to family, and their livelihoods - the ironmonger, the sweetshop, and the butcher. Each of them hiding their lies, disguising sin, and coping in the only way they know how. The world first heard of Klaus Fuchs, the head of theoretical physics at the British Research Establishment at Harwell, in February 1950 when he appeared at the Old Bailey, accused of passing secrets to the Soviet Union. For over 60 years the Governments of Britain, the United States and Russia tried to cover up the truth about his treachery. Here, Mike Rossiter unravels the truth about his clandestine meetings, deadly secrets, family entanglements and illicit love affairs, all set against the tumultuous years from the rise of Hitler to the start of the Cold War. The novel 'Life on Mars' was originally conceived as a stage rock opera inspired by the work of David Bowie. A little over an hour ago, Vic had been a weak 68 year old man, but that wasn't what he saw in the mirror now. Instead, he saw a weak young man, clearly in his mid twenties. Instead of his unkept mop of hair he sported a rubber cap and from it protruded dozens of plastic tubes. They trailed over his shoulders like a wig of translucent dreadlocks. "What year is this?" He whispered, leaning forward to study his reflection. There was no reply. "Miss, er Blue. I asked you a question." he said a little louder, trying to remain calm. "The year is Tvc15." she replied cheerfully, then realising he would not understand Blue bit her bottom lip whilst quickly making the conversion. "T, Twentieth Century, V for 500 plus fifteen years. That would be?" She looked up for a moment. "Yes, to you that would be the year 2515." The phenomena of ghosts and hauntings are very real experiences that more and more people are encountering every day. It is their true cause and nature that is the ongoing mystery. 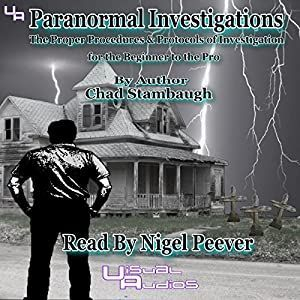 In Paranormal Investigations, author Chad Stambaugh discusses the process of trying to find that one piece of evidence that could prove, without a doubt, that ghosts are real. Paranormal Investigations shows both the beginner and the professional when and how to correctly operate the different types of equipment integral to a paranormal investigation - cameras, camcorders, voice recorders, digital video recorders, EMF detectors, dowsing rods, pendulums, and more. In addition, Chad breaks down, step by step, the correct procedures for conducting both public and private investigations, including how to deal with clients, what to look for, how to look for it, and how to document an investigation. Through this detailed guide, Chad works toward creating paranormal unity among those who research the events or phenomena that science can't or won't explain.